I am forwarding this e-mail to you to demonstrate that my e-mails are not lone Cries in the Wilderness. Nationwide, the elderly and the disabled who have a few dollars in their jeans are being exploited. Elder Cleansing is a way of life for the corrupt and amoral political and judicial elite who prey on the aforesaid elderly and disabled and their families. Florida, Illinois, Texas, Arizona, California, Pa, Ohio ***** all have the same problem. As I live in Illinois, I’ve had the opportunity to witness some of the most disreputable of the miscreants including Jerome Larkin, the administrator of the Illinois Attorney Disciplinary Commission (IARDC). The GAO has written four reports to congress and they all can be found on the NASGA website. Probate Sharks blog and MaryGSykes blogs detail some of the most horrendous civil rights violations by sitting judges and their corrupt co-conspirators. Only the Nazi war criminals invaded the mouths of their victims for the gold in their teeth; however, Alice Gore was victimized right in Cook County, Illinois. Anguished cries of horror from her family were met with Larkin informing the family that the Illinois Attorney Registration and Disciplinary Commission found the infamy perfectly ethical, and when Attorney JoAnne Denison exposed the corruption on her blog the Illinois Supreme Court issued an interim suspension of her law license and accepted Larkin’s thesis that reporting corruption in compliance with Rule 8.3 and 18 USCA 4 was akin to yelling fire in a crowded theater! Enjoy to book review and the book! 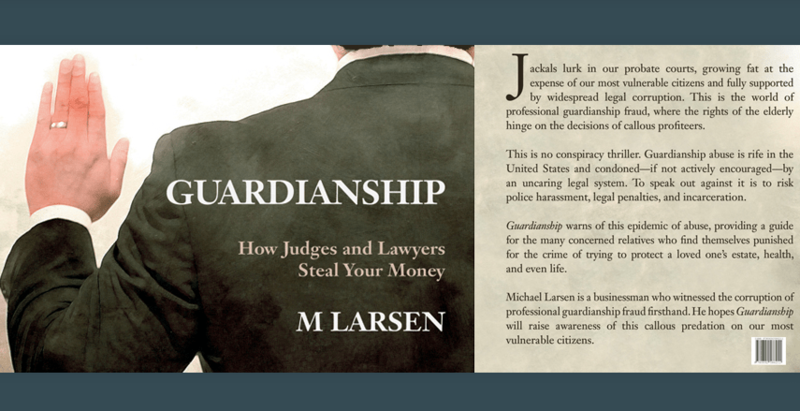 Larsen, the editor of GUARDIANSHIP, is a businessman whose family experienced similar frustration and despair in probate court. He states that “elder cleansing,” a term coined by attorney Kenneth Ditkowsky, “has escalated since the last Governmental Accountability Office’s report published in 2010.” With additional inspiration from Charles Pascal’s interview on View From the Bunker, Larsen organized contributors to address the GAO’s request for a summary, resulting in this unique resource book for families, citizen activists and the general public, not to mention journalists and attorneys. It is written from the point of view of family members who have given their all to stop the torture, thievery, and often the killing of their elderly. This important reference work adds to what is already known about the greed of corrupt judges, attorneys, guardians and psycho-social hucksters on display in other judicial venues. Stories included in the book follow the same basic sequence of events: (1) allege that the target is in imminent danger – to justify emergency temporary guardianship and the isolation of the target from his or her family – all without even a pretense of a due process hearing; (2) employ a willing psychiatrist or other MD to prescribe the contra-indicated psychotropic drugs to propel the ward into a stupor just in time for the “competence evaluation;” (3) begin the feast by liquidating the target’s non-liquid assets and looting everything in sight; and (4) continue looting until the target is killed by the premeditated over-drugging topped off with opiates. On occasion guardians can and do continue looting even after their victim’s death. Each contributor’s story reveals through its personal, state-specific details that what we are seeing in guardianship court is no anomaly created by a “few bad apples.” Some 64% of probate courts responding to a federal agency survey indicated that guardianship abuse had become so flagrant they admitted having taken action against at least one guardian for misconduct in the previous three years. [p. 156] The National Association to Stop Guardianship Abuse [NASGA] estimates that some five million elders lose their life savings to the financial crimes of guardianship every year, a national tragedy that translates to an annual theft of some 2.6 billion. [p. 142]. A very few times a contributor’s style of writing yields a less than clear understanding of who did what and when. But in those instances a careful re-read usually resolves the confusion. Overall the impression that stuck with me after reading the book in two sittings was a sense of oppression and futility, but also hope that the enormity of the losses is such that more of the public will finally wake up, get off the couch, and get organized. The only inaccuracy or slight misinterpretation I found was the reference to the belief that ethics rules for lawyers require that they cover for each others’ crimes. [P. 129] Certainly this is the conduct that usually occurs, in the experience of this reviewer. Lawyers, like corrupt judges and police officers, do not usually report on each other’s misconduct. Indeed, there is nobody to report to in any meaningful way. Judicial complaint tribunals are secret, self-policing travesties, as are bar disciplinary entities and police department internal affairs departments. In light of this exposé and others, including a recent 60 Minutes expose of Wall Street lawyers, more citizens are waking up to the alarming reality that the justice system itself may not be designed to dispense justice to the American public. Nevertheless, Rule 8.3 of the Model ABA Rules of Professional Conduct does technically require the reporting of “substantial” ethical breaches. From the courts of Florida, a state once thought to be a refuge for the elderly, to those in California, Nevada, Texas and other states, the “isolate, medicate, take the estate” m.o. repeats. The style of each story reflects a continuum from angry outrage, through informative warnings. Included throughout are references to websites, telephone numbers of activists, and citations to other reference books, websites, and media contacts. There is definitely information and inspiration enough for any reader looking for answers and direction. Some of GUARDIANSHIP’s contributors comment that those without money are safe from predatory guardians. Certainly the super-wealthy, such as the unfortunate Brooke Astor, betrayed by her son, are not shielded by their millions. [pp. 132-133] Some contributors remark that even the poor and those who are not elderly can be targeted, locked up, and plundered for their social security checks – while the guardian foists the substandard “care” of the “ward” on the public in underfunded human warehouses. Often a relative could and would have cared for the elderly person personally if they only had the use of the person’s meager income to buy his or food. The final chapter provides us with no real solutions. There are no advance directives, living wills, trusts or other more creative legal instruments that cannot easily be ignored or undone by a corrupt judge or attorney. What remains is a stark reminder that the probate court oppressors’ schemes to steal from us and lay waste our families and our heritage, all constitute criminal acts. GUARDIANSHIPmay well be a warning to the public that half-way measures failing to address the overarching criminality will be useless. The challenge is to find effective means of bringing these high-placed criminals to justice before we pay them any more of our tax dollars to plunder and then murder those we love. Baltimore Maryland . I don’t know why this place is never mentioned . My wonderful brave mother has had everything bad done to her . Locked dementia unit , drugging , the house she loved , sold and her assets disbursed . She begs to be home every day my adult daughter has gotten physically ill seeing what has been done . I have tried to get my mother free . We need help. We are trying to keep my mother alive . We need her out of this . Baltimore Maryland is not large . The players in this elder crime are all known. My mother has been tormented and stolen from by people who have wealth , family , generations before them who left them estates . Why do they do this to people that had to work hard for every penny and had no one to help them . It is criminal . Nothing else. I am sooo sorry. Let me know if and when you are ready to write. Save all the pleadings and I can write the book from the pleadings. I will continue to pray for you and your mom.